The ER units are used as both clutches and brakes that feature a centrifugal expander-tube design with moderate starting and stopping loads. In the ER design, the tube component provides shock absorption and transmits the entire torque load, providing longer life in high-duty cycle applications. The ER was designed for commercial laundry, tire builders, paper converters, textile machines and many similar applications. 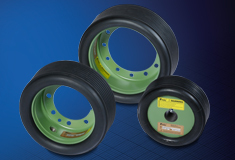 The ER element can also be used as a shaft coupling, light-slip clutch, or tension/holding brake. High-torque in a compact design.